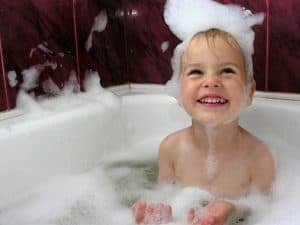 Do you ever have a hard time convincing your kids to take a bath? Some nights the fight just isn’t worth it. But on those other nights….that’s when I pull out the bath bombs. Kids love them. The bigger the better. It’s like a science experiment in the water! I never spend money buying bath bombs because they are too expensive and I prefer to control the ingredients. 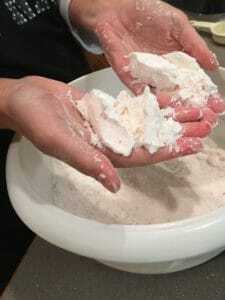 The store-bought ones are beautiful but are often laden with too many toxic ingredients. 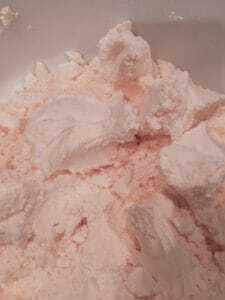 Homemade bath bombs are very inexpensive and they can easy to make. They can even be easy if you are okay with them not being perfect and you are using a basic bath bomb recipe. 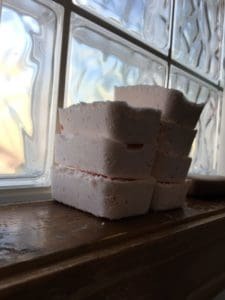 When I was first learning how to make bath bombs I didn’t have any luck. I watched countless YouTube videos and I scoured Pinterest. They kept coming out either too wet or exploding before they set. Or so dry they never set. I even had an #epicfail once where they grew out of their molds 5 times and in my infinite wisdom I decided to put them in the freezer to stop the fizzing. Yeah, that doesn’t work. So, the goal here with this basic bath bomb recipe is just to get your kid into the bath. If you want beautiful, multi-colored, glittered bath bombs, then look elsewhere. I’m talking about 10 minutes in the kitchen so your kid will just take a bath! And with no extra chemicals. Besides, have you heard what all those chemicals in the bathwater are doing to your skin?! 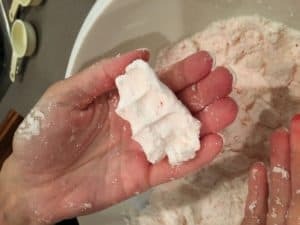 I’ve found the easiest way to make bath bombs is to skip the traditional molds. I use a silicone mini loaf pan. They may not end up as beautiful gifts but this isn’t the point. With a silicone loaf pan, you can pop them in and out, plus it isn’t possible for the bath bomb to explode past its mold. If you are just starting out, this is a great tool to experiment with. 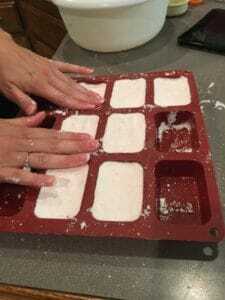 Then one day, you can make fun shapes using different bath bomb molds! 1. 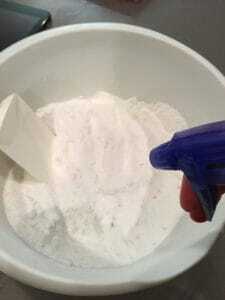 Combine Baking Soda, Cornstarch, Citric Acid, and Epsom Salt in a large bowl. Stir well. 2. Combine Water, Coconut Oil (if solid, then melt first before adding), Essential Oil, and food coloring (if adding) in a separate bowl. 3. 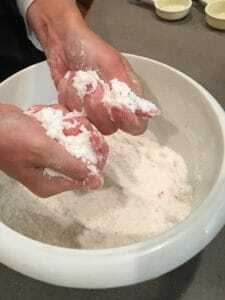 Add liquids to the Baking Soda mixture and combine quickly. 4. Once thoroughly mixed then take your spray bottle and begin spraying the water and using your hands work the water into the mixture. 5. You will want the mixture to stick together but not so much that it begins fizzing. 6. 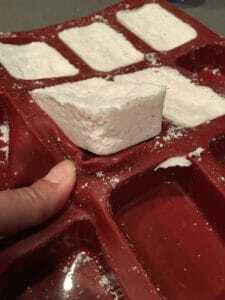 Set the mixture into your molds. 7. Let it sit for at least 2 hours or overnight. If they hold together when you are taking them out, they are ready to go. 8. Get that kid into the bath! !